Even if you don’t plan to completely combine your finances, you still need to talk about money and make sure you are on the same page. Even couples that keep some aspects of their finances separate do better, maritally speaking, when they share many of their financial decisions. 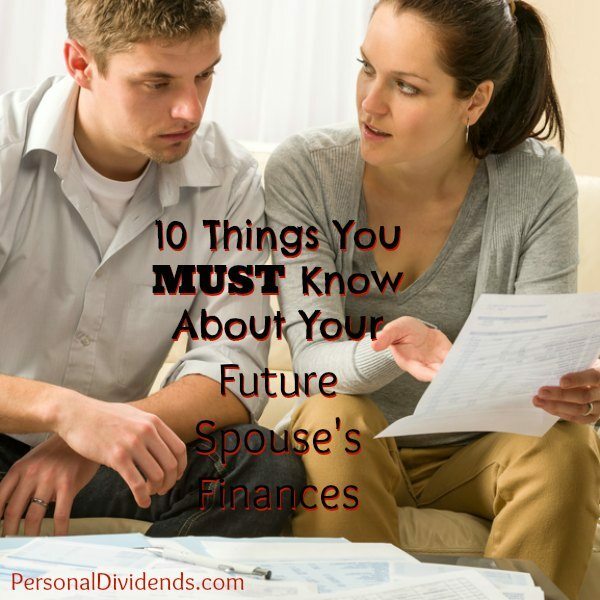 As the date approaches, ask yourself if you know what you should about your future spouse’s finances. Joshua Kadish, with RPG-Life Transition Specialists, offers 10 things you absolutely must know about your future spouse’s money before you make the final commitment. The biggest thing that couples neglect to discuss before tying the knot? According to Experian, says Kadish, it’s the credit score. “Poor credit may indicate that one person has money management issues,” says Kadish. Also, your partner’s poor credit can hold you back as you try to make large purchases together, like a car or a home. “To improve bad credit, discuss financial mistakes and work together toward changing bad money habits,” suggests Kadish. He also points out that you need to plan for situations in which one partner makes much more than another, or works on commission. As you plan to tie the knot, you need an accurate picture of what your future spouse has in terms of assets. “If your partner is living paycheck to paycheck, develop a plan that allocates money to an emergency fund,” says Kadish. This is a biggie. It’s important that both of you are honest about what debt is being brought to the marriage. In some states, getting married means that you all of a sudden share responsibility for your partner’s debt. Check into the laws, and be very careful about agreeing to turn your partner’s personal debt into your shared debt. “Determining whether bank accounts will be separate or joint before the wedding can prevent financial fights down the road,” says Kadish. He suggests working out a plan ahead of time, so that you both know what to expect later. He says that most couples use a system in which each partner has an account that can be used for personal discretionary spending, while shared expenses are funded by both via deposits into a joint account. Don’t forget to talk about your health insurance coverage. It might seem a little boring, but the reality is that you need to figure out how insurance will figure into your new household. “You may want to look at which health insurance policy is the most beneficial and take advantage of the special enrollment period and join your spouse’s plan,” suggests Kadish. You need to talk budget as quickly as possible, Kadish points out. “Evaluate your combined cash flow and determine how bills will be paid, money will be saved, and finances will be allocated,” he says. Talk about your personal and shared priorities, and work out a plan that allows you to work toward goals together. Take stock of the benefits you both receive from work. Also, pay attention to which benefits allow the addition of a spouse. You can also figure in 401(k) and pension plans. Don’t forget that you and your future spouse will need to add each other beneficiaries to work benefits, insurance policies, and other accounts. Share information about your retirement accounts, and find out about your future spouse’s. You need to make sure that you are still eligible to contribute to them, especially if you have been contributing to an account like a Roth IRA with income limitations. Talk to a tax professional about how your marriage might affect your retirement account contributions, as well as other items that can impact your tax situation. Take the time to talk about financial goals. You need to make sure that you are on the same page, or you will have a lot of fights and frustration. “Map out a plan that can help you reach your shared financial goals,” says Kadish.